The guide is only for the Samsung Galaxy Express with model number I8730. Download the Samsung USB Drivers  direct to the Windows computer you are using. Understand that flashing a custom recovery typically does void a warranty, although most have already done that anyway by rooting the device. You need to unlock the bootloader before using this guide. 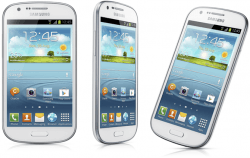 You need to have rooted the Samsung Galaxy Express I8730  before using this guide. 1. Download the Flashify app from Google Play here  direct to your handset. 2. Download the ClockworkMod recovery file from this page  directly to the Windows computer. 3. Connect the Express smartphone to the computer and transfer the file to the root of the SD card. That means don’t hide it in any sub folder. 4. Disconnect the handset from the computer now and open Flashify. 5. Grant the SuperSU access when it requests you to do so. 6. Navigate to Flash > recovery image and upload the CWM file you transferred to the root of the SD card. 7. Install the CWM file and wait until it uploads. 8. Tap the reboot now option and your device will reboot with the ClockworkMod recovery image fully installed.